It’s 8.30 pm and I’m glued to the black and white screen. Sarah the Kakapo is the star of the show. At the moment she is a still feathery pillow with eyes like shiny black berries that open and close from time to time. I’m sitting in a tent 300m away from her nest, in the heart of the forest of Codfish Island, the epi-centre of the Kakapo Recovery Programme. An infra-red camera has been installed at Sarah’s nest to relay her movements to the palm-sized monitor I’m watching. 8.36 p.m. Sarah’s left claw emerges to scratch her left cheek. I note that down. I’ve come to Codfish Island to be a volunteer ‘Nest Minder’ for a fortnight. Nest Minders are required to keep a vigilant eye on kakapo Mums overnight during the breeding season. The nocturnal birds leave their nests at night to feed, but if they’re gone too long their eggs or chicks risk getting too cold and may need incubation or warming up on the nest with a ‘heat pad’. 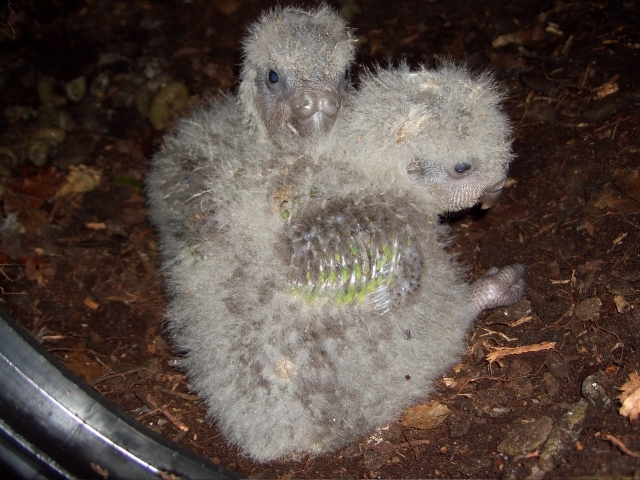 Two of the twenty-three kakapo that have been born this season. Sarah is sitting on two fertile eggs and they are excruciatingly precious. With just over 100 kakapo in existence on the planet, eggs and chicks are the lifeline to the species’ survival. The Kakapo Recovery Programme has been working with single minded dedication to coax the jumbo-sized emerald parrot back from the brink of extinction, and since the start of this year’s breeding season the population has already increased by 23. It’s set to be a bumper breeding year, in part due to the potentially good crop of small flame-red berries of the rimu tree they will raise their chicks on. 8.59 p.m. Sarah stirs and rolls an egg with her beak. I note that down. When she leaves the nest at night, thanks to an infra-red sensor installed at her nest, an alarm will chime from the monitor in my tent. Feeling every bit a part of a kakapo spy operation, I’ll then radio base camp – a.k.a Sealers Hut – to let them know. She has two hours to return before the temperature of her eggs becomes a concern. She might leave at 9.30pm, 11.30pm or 5am – it all depends when mama feels like leaving the house and hitting the night scene for her berry-fix. But for now she ain’t goin’ nowhere. There are 20 Nest Minders, 7 Kakapo Rangers, 3 Supplementary Feeders and 1 Cook on the island at the moment. It makes the cosy Sealers Hut a bustling, social place. We converge there every morning when, ‘How was you’re night? Did you get any sleep?’ is the rhetorical question asked over bowls of muesli, bacon sandwiches and steaming mugs of tea or coffee. Around 6pm, after a belly-warming meal, like bees from the hive, Nest Minders set off in all directions to campsites around the island. It’s just past 9pm and darkness has fallen. The raucous Codfish Island night time society begins to wake up, making an incredible cacophony. Petrels go beep-beep-beep, bats squeakily sing and male kakapo let out their amorous sonic booms to attract females – their deep reverberating booms like the bass line of a soundtrack. This predator-free island teems with life – bellbirds, tomtits, kakariki, kaka and grey warblers are all regular companions on the tracks. The forest feels truly alive, all verdant growth and a barrage of eye-peeling shades of green. I’m tickled pink that I made it up to my campsite in 1 hour tonight. On my first night, I got lost twice, and it took me two and a half struggling hours to get here. I huffed and puffed the whole way and felt way, way out of my usual city-dweller comfort zone. But now, on night five, I’m enjoying the hike and my jelly thighs are setting to something firmer. The fitness and stamina of Kakapo Rangers is in another league altogether. They’re like gazelles of the forest, walking the tracks by night and making visits to nests to check on birds’ health, repairing equipment and generally solving all problems. One has just arrived at my campsite. Jase – who tells me he recently walked 29kms in 36 hours doing work around the island – is here to check on Sarah’s eggs and spray her nest to kill the mites which seem to be making her scratch more than usual. Now it’s a waiting game for her to leave the nest so this work can be done. 11 pm Sarah is still fast asleep on her nest. Jase wedges himself alongside my Lilo in the skinny one-man tent to get a little shut eye. 2.36 am The monitor alarm goes off and Sarah appears to be chasing something from her nest – possibly a petrel. She returns and goes back to sleep. 3.41 am The monitor alarm goes off again, but Sarah is just fossicking around the edge of her nest. 4.01 am The monitor alarm goes off again and Sarah leaves the nest only to return after 1 minute. Now she is just being a tease. 7.02 Sarah finally departs from the nest. Jase and I pull ourselves out of sleep and down the steep incline to Sarah’s nest. First he sprays it. Then, with the delicacy of a heart surgeon, he ‘candles’ the eggs by shining a torch beneath them so the insides are lit up with an orange glow. He points out a mass of red which is the embryo. Veins run off it around the inside of the egg, creating an effect like a bloodshot eye. Jase sketches each egg’s inner appearance, weighs them. All appears to be well. As he is placing them back in the nest there’s a rustling behind us. Sarah has returned to the nest and is climbing up an overhanging branch. Or perhaps wallamphing up an overhanging branch, would be a more accurate description. Kakapo are the biggest parrot in the world – Sumo wrestlers of the bird kingdom. They are also unusually beautiful with their bright mottled green plumage and quizzical round face. We make a hasty retreat from Sarah’s nest and back at the tent I can see she’s sitting back on top of those eggs. I radio base and let them know she’s returned. Jase races off into the forest and I pack up my things, setting off for Sealers Hutt at 8.30am. It’s going to be a beautiful day and morning sunshine drips like ice-cream through the trees. It’s good to be alive. And even better, to be doing something to help keep New Zealand’s incredible kakapo alive too. Emma Gilkinson has contributed 3 entries to our website, so far. View entries by Emma Gilkinson. 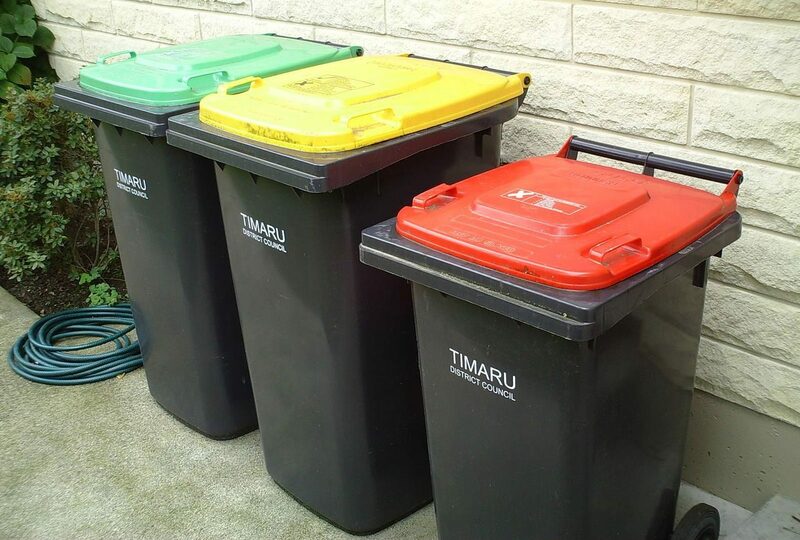 Nature’s Voice: Why Recycle Rubbish? Twenty three new kakapo – that’s fantastic. Now that I’ve read your piece I really want to become a nest-minder myself. Codfish island is south of Stewart islabnd though, isn’t it? Rather chilly I imagine even at this time of year….. Loved reading your “Night in the life of…” Our son Errol is the Aussie ranger on Codfish and even though he’s given us a run down on how things work there it was great to read the time frame of a night’s work. Keep up the good work. i am doing a assignment on native animals and i choose the kakapo because they are so unique! !